Want to wear your passion for military baseball without spending $200 for a reproduction jersey? These military Tees from Ebbets Field Flannels are the perfect solution. Almost a full month of the 2016 baseball season has elapsed and we are beginning to see the alignments taking shape within the standings. My family knows that I follow three Major League Baseball teams; LA, Boston and Seattle. When I was a kid, I discovered the Blue Wrecking Crew of LA during the Cey, Lopes, Russell and Garvey era (“The Penguin,” Ron Cey was from my hometown and my favorite Dodger) watching the NBC Saturday Game of the Week which the Dodgers and my other favorite team of that time, the Red Sox, seemed to dominate the recurring programming. My passion for the Mariners didn’t materialize until the later 1970s with they came into being. Seeing these three teams perched atop their respective division standings as I write this gives me hope for an entertaining season. Heartbreak is certain to follow as the season wears on when one or all three teams will fall back to earth. Despite dropping two straight to the Marlins at home, the Dodgers remain in front of the NL West. Big Papi’s final ride of his career finds his Sox sharing the AL East lead spot. The Mariners are surging and surprising the naysayers (including me). As the season continues, my collecting interest presses onward. A few weeks ago, a package arrived from my favorite clothing manufacturer bearing five wonderfully nostalgic garments that fit directly into my area of interest and the subject of this blog. While I have referenced Ebbets Field Flannels in a few postings regarding their jerseys and caps (see: Replicating Military Baseball Style, US Marines Baseball Uniforms) and how this company does fantastic work in recreating this forgotten part of the game’s history. The five garments that arrived are part of EFF’s vintage T-shirt product line that borrows from various elements of history (logos, graphics, patches and other visual cues). The visuals from select teams are tastefully nostalgic and classic designs that are imprinted onto high-quality, domestically sourced jersey-cotton T-shirts. 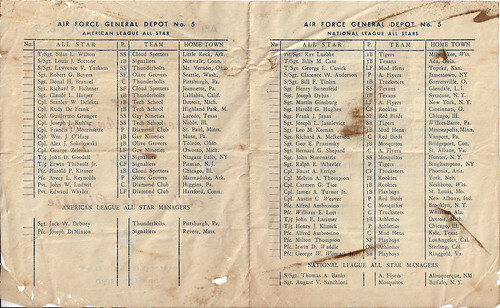 I managed to purchase this program and scorecard for the Third Army Championship games, hosted in early August of 1945 at Nuremberg Stadium in Germany. I owned a T-shirt (of the Vincennes (IN) Velvets) from EFF years ago that I wore so often that it was quite literally reduced to rags after years of use (please reissue this one again, Mr. Cohen!) so I was familiar with the quality of the shirts. The very tastefully executed graphics are over-layed onto the corresponding colors creating a visually appealing garment that will make you want to wear it as often as possible. Buying the 5-pack was an obvious choice so that I can enjoy wearing a bit of history without donning a heavier wool flannel jersey. For a short time, EFF has introductory pricing (20% off the $30.00 price) on these Military Baseball T-shirts that would make it worth the $24 to give one a try. I recall the very first professional sports team jersey that I was given as a child was a Los Angeles Rams (the classic blue with white trim) that came as part of a uniform set (which included trousers, shoulder pads and a helmet) for Christmas in the early 1970s. In the middle of that decade, my father gave me a fitted San Francisco Giants ball cap that I wore until it no longer fit – even though I was, by then, I die-hard Dodgers fan. By the time that my hometown received NFL and MLB teams of our own, I was fully entrenched as a Los Angeles football and baseball fan. My original Los Angeles Rams football uniform kit was very similar to these made by Rawlings, dating back to 1971. When I was twelve, my grandmother gave me a beautiful Los Angeles Rams jersey (#84) for my birthday that I wore for a few years. I remember the first jersey that I bought for myself a few years later, an on-field Seahawks #80 (Steve Largent) mesh shirt that I still have today. I was always a bigger fan of baseball and yet I still never owned a jersey from my favorite team(s). I wouldn’t have a baseball jersey for years to come. When I was at my last duty station, I read an article about a company that recently started operations, using old stock wool flannel to recreate replicas of vintage baseball jerseys from the minor league teams of decades long since passed. When I discovered that the company, Ebbets Field Flannels was local, I paid them a visit that same day. I saved up for a few weeks and managed to purchase my first (of what would become nearly twenty) of their line of jerseys, a 1939 San Francisco Seals design. Over the ensuing years as EFF expanded their product line, they began to incorporate jerseys from the Armed Forces service teams from World War II, beginning with Joe DiMaggio’s 7th Army Air Forces design. Later, they would add Bob Feller’s Great Lakes home and road designs. It is plain to see that EFF’s ownership has a passion for military baseball and the service team uniform items as the catalog of designs continues to expand. For collectors like me who would never don a 70+ year old garment for daily wear, acquiring an honest reproduction of the for my personal enjoyment is a great substitute as I leave my collection to be preserved for posterity. Last fall, I had the opportunity to display my collection and though I was quite pleased with what I had to display, I felt that a few other items would fill in some gaps where my items were insufficient in conveying the narrative of the connection between baseball and the armed forces. I was a little reluctant at first, but as I began to prepare for the event and arrange my display, I found that adding in one of my reproduction jerseys and ballcaps was a nice augmentation to the original uniforms and artifacts that would be shown. I placed a 1943 Great Lakes Naval Station home jersey (as worn by Bob “Rapid Robert” Feller) and a 1957 Naval Academy ball cap, both from Ebbets Field Flannels. 1945 Third Army Red Circles jersey (Ebbets Field Flannels image). 1944 7th Army Air Forces road jersey (Ebbets Field Flannels image). 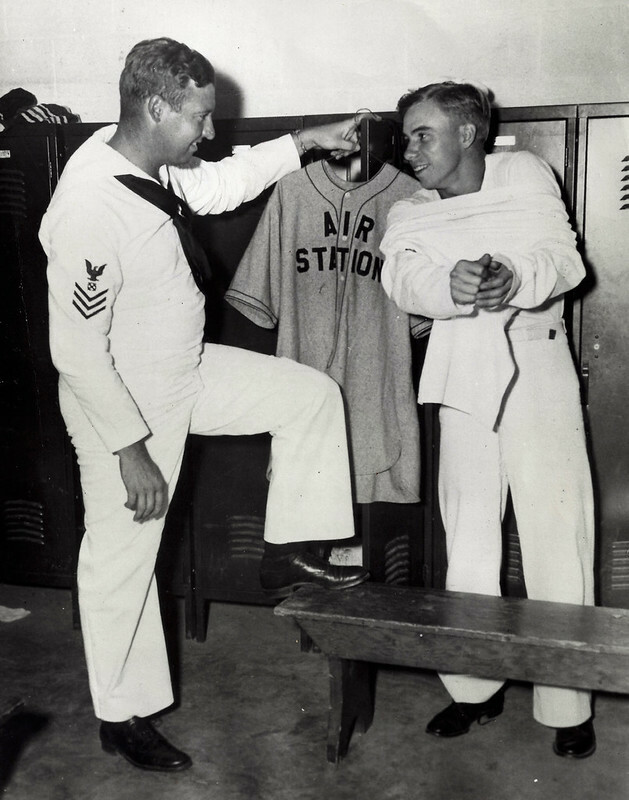 1943 Great Lakes Naval Training Station, home jersey (Ebbets Field Flannels image). 1943 Great Lakes Naval Training Station, road gray (Ebbets Field Flannels image). 1944 United States Marines, road gray (Ebbets Field Flannels image). 1957 Naval Academy baseball team cap (Ebbets Field Flannels image). 1957 Naval Academy baseball team cap (discontinued). Great Lakes Naval Station Grounds Crew Jacket (Ebbets Field Flannels image). 1943 Navy wool and leather ball club jacket (Ebbets Field Flannels image). For those who treasure historical commentaries on the game and its uniforms, I encourage you to follow Ebbets Field Flannel’s blog.